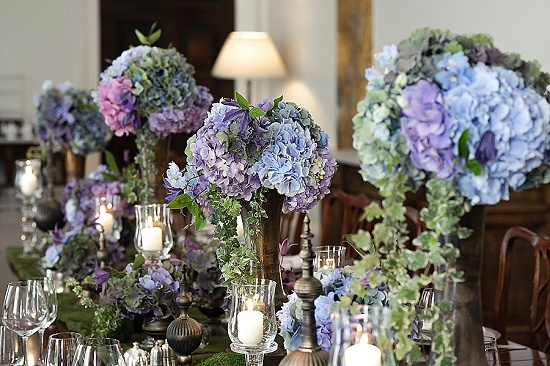 Mary Jane Vaughan is one of the country's most highly respected florists. Always charming, creative and ever passionate about the world of flowers, Mary Jane Vaughan is a worthy winner of the Flower Market Award for Florist of the Year 2015. Mary Jane grew up in a flower-growing family in Colombia. A childhood surrounded by flowers gave Mary Jane an appreciation of the beauty of flowers and the work involved cut flower production. After time spent in the United States, Spain and sailing, Mary Jane finally settled in London, opening her first shop back in 1985. 'Fast Flowers' in the busy Fulham Road was a bustling store and it was here that Mary Jane's exquisite floristry came to the notice of the media and of event companies. "I realised that I am not a great retailer," says Mary Jane modestly. "I like to work with people one to one and to do bespoke things. When I could afford to, I closed the shop and moved the business to our studio in Battersea in part to be closer to the Flower Market." It's at Havelock Terrace that Mary Jane Vaughan and her team create the floral designs for events and weddings in some of the most prestigious and exclusive venues in London. It took true imagination and creativity to stage a spectacular wedding reception in the unprepossessing environment of Billingsgate Market. "Oh, we had so much fun!" enthuses Mary Jane. 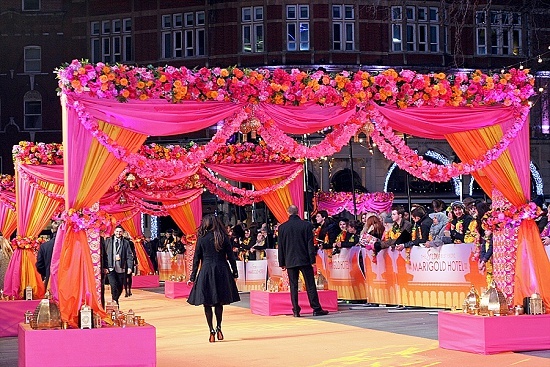 "We worked closely with a great event company. We divided the space into two halves for the reception: one open, clean and crisp with sofas and big trees of molucella - pretty but understated. Then you walked into a lovely room of black walls but very tall ceilings. I suggested lowering the ceilings by creating chandeliers made of foliage. We had the chandelier made of three rings of metal, which we filled with foliage. It looked really beautiful and made the space into a warm place. 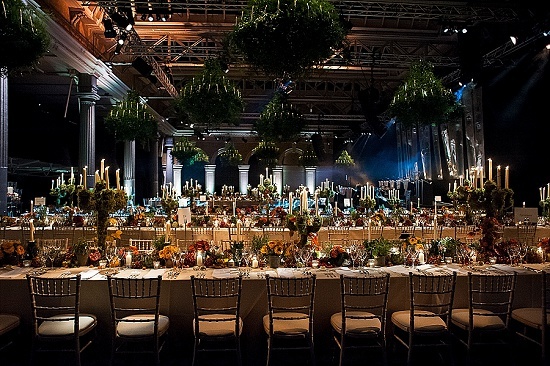 The event had a harvest feel: we covered candelabras in moss, we had pomegranates and artichokes filled with flowers. We had lots of fun. The client loved it, and that made us very proud." Testament to Mary Jane's lovely nature is the fact that so many of her team members - florists and drivers - have been with her for over 20 years. "I am really lucky," says Mary Jane. "We all really care about what we do. Kathleen and I have spent the last 35 years working together. She is incredibly organised. I couldn't do my work without her. She gets the brief and splits it down into money - which is really important!" "We have a client liaising team of four of us, all florists. I want us to be known for excellence in design and efficiency," explains Mary Jane. "Efficiency is just as important. We pay our bills on time, we get back to customers quickly with creative quotes and images." Mary Jane Vaughan Flowers source all their flowers, foliage and plants from New Covent Garden Flower Market. "We are sourcing almost all our flowers from Zest Flowers this year. They are always friendly, have very good product and are incredibly efficient. They are amazing!" Porters Foliage are Mary Jane's primary port of call for foliage, as they carry such range and variety. For sundries, the team turns to Whittingtons and C Best, supplemented by decorations from the Paris Maison & Object show. "We couldn't live without C Best," says Mary Jane. "I think they are really talented in their taste and range. I admire them a lot." Congratulations to Mary Jane Vaughan Flowers, Florist of the Year 2015 in the Flower Market Awards!